maybe its something I haven’t confirgured or something I’m missing. there is no upn for the domain that was created through solidcp. Is this normal ? or is this something I need to create manually ? We have actually researched this recently (it’s an old WebsitePanel issue we inherited). SolidCP does currently not create a UPN suffix (i hope to fix this in v1.1.0 but can’t guarantee). 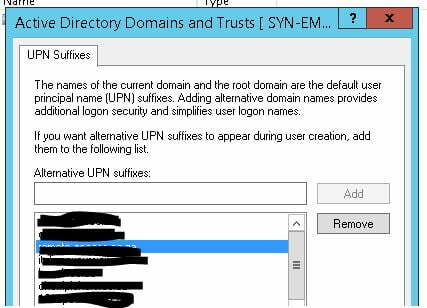 It does however still work as expected aslong as your Exchange has owa set to use UPN instead of it’s default setting (you can review the exchange 2013 / 2016 guide for the command to set it). where it gets tricky is custom settings outside solidcp (like ecp) which will not always have the correct domain suffix listed (so be careful editing outside of SolidCP untill we resolved this issue).